Southampton's William King celebrates after putting his side into a 1-0 lead against Manchester United. WHILE Manchester United failed to reach the semi-finals of the SuperCupNI, there were celebrations for two locals teams. Both Club NI and County Antrim booked their place in the last four of the Junior tournament thanks to impressive Wednesday wins. Declan Devine's Club NI are unquestionably the story of the SuperCup so far. Devine's kids are the only team who managed to win all three of their qualifying games, which is all the more impressive when you consider that they are a full year younger than their opponents. They secured their semi-final spot with a 2-1 win over Middlesbrough in Broughshane. The goals were scored by Connor Bradley and Ross McCausland. Bradley is on the books of Liverpool. Devine's boys will face Stefan Seaton's County Antrim in Thursday's semi-final. They booked their place in the last four with a 2-0 win over American side Strikers in Portrush. Christopher McKee scored both goals. In other semi-final Glasgow club Rangers will play American outfit Global Premier Soccer Bayern. 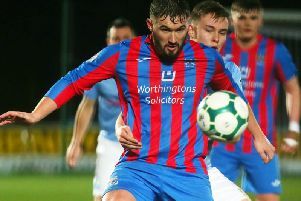 The young Gers impressed as they defeated Mick Kavanagh's First Choice Soccer at The Ballymena Showgrounds, winning 2-0. GPS ended Cherry Orchard's winning run in Castlerock, with a 1-0 win. A draw would have been enough to see Manchester United reach the last four, but they were picked apart by an impressive Southampton side. United fell behind in the third minute when the unfortunate Ben Pleavin turned a cross into his own net. Southampton doubled their lead in the 15th minute when Frank Lovett used his pace to score a fine solo goal. The young Red Devils never looked like getting back into the game. Elsewhere, it was a good day for the county teams. Armagh enjoyed a narrow win over Swindon Town at Anderson Park in Coleraine. The local side won 2-1 with goals from Adam Wright and Jack Scott. David Bryson's Down side claimed their first win of the tournament with a 2-0 win over Mexican side Colina down in Castlerock. Fermanagh also claimed a victory, defeating Dundalk Schools League 3-2 in Ballymoney. The all-county clash at Anderson Park between Tyrone and Londonderry turned out to be a feisty affair. Tyrone player Conor Williamson received a rare red card for an off the ball altercation. Tyrone still managed to run out 1-0 winners. North Dublin Schools League dispatched New Zealanders M Sport at the Riada. The Dubliners won 7-1 in Ballymoney. Sheffield United recorded a narrow win in Clough, beating Chivas of Guadalajara 1-0. American side NC Elite recorded a 1-0 win over Plymouth Argyle in Clough. The 20 teams that didn't reach the semi-finals of the Junior section will compete in various subsidiary cups over the next two days.